The sample size refers to the number of individual pieces of data collected in a survey. The sample size is important in determining the accuracy and reliability of a survey's findings. In practice, the sample size used is determined based on the expense of data collection, and the need to have sufficient statistical power. In this table, you will find the exact amount of responses you need based on the confidence level or margin of error. The margin of error is the range of values above and below the sample statistic is called the margin of error in a confidence interval. The most common values are 1%, 2, 5% and 5%. For example, suppose we wanted to know the percentage of adults that work out weekly. We could calculate a sample size to ensure that our sample estimate will not differ from the true population value by more than 5 percent (the margin of error) 90 percent of the time (the confidence level). A confidence level refers to the percentage of all possible samples that can be expected to include the true population parameter. 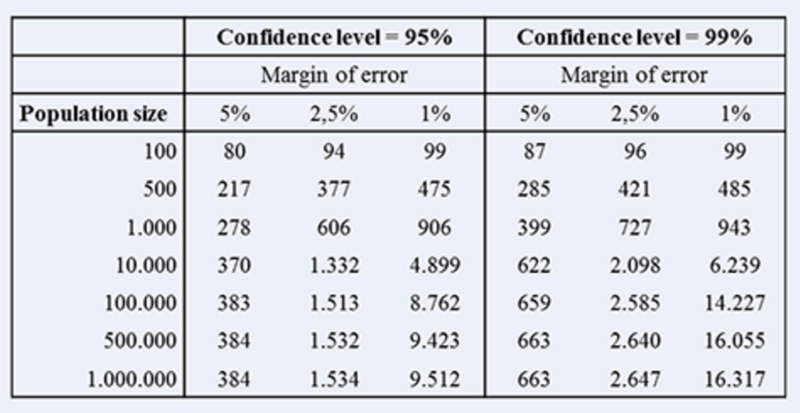 For example, suppose all possible samples were selected from the same population, then a 95% confidence level would imply that 95% of the confidence intervals would include the true population parameter. For this calculator, we used a 95% confidence level and a 5% margin of error. If you're looking for ways to increase your survey response rate: take a look at these 34 tips. You'll find a sample size calculator in tip number 8.